Lockheed Martin photo by Michael Jackson. At an event billed as the “Olympics of the mind,” Lockheed Martin hosted students at 11 locations across the country to participate in “Code Quest”, an annual event that inspires students to seek education in STEM. Fifteen teams from across southern California gathered at Skunk Works at Air Force Plant 42 in Palmdale, Calif., April 29, to test their computer programing knowledge. Teams of two to four students worked together for 2.5 hours to solve 15 problems created by Lockheed Martin Information Technology professionals. During break, students and coaches toured certain parts of the facility that included a wind tunnel test and even sat in the Hybrid Airship. Blown away by the size and comfort of the airship, students said it looked like a giant marshmallow and that they will be paying attention to the program to see how it flies and maneuvers. “The whole event and the tours inspire students to take their STEM studies seriously, because they can see real world applications,” said Lockheed Martin Communications Senior Manager, Melissa Dalton. Pursuing education in science, technology, engineering and math is required to build the newest supersonic aircraft, spaceships, solve the world’s energy problems, and to make great advancements in the medical field. Team “Troy Warriors” consisted of cousins: Izzy Wang, Angela Wang and William Wang, all juniors at Troy High School in Fullerton. “I think William just comes for the free lunch and candy, but Izzy and I are here for the code,” joked Angela. Izzy said she likes coding because it is something she can accomplish by herself without following guidelines. “Math has certain formulas, in coding you just figure it out, you do it how you want to and solve a problem — I love it, it’s fun!” The team placed third in the advanced category. Braskin said that this is his second year at the event. Donnie Carnes, EBS project manager from Marietta, Ga., said there is a lot to consider when choosing a date for the competition. “A traditional school year is a thing of the past,” said Carnes. Code Quest managers must consider numerous dates of school breaks, the availability of hundreds of Lockheed Martin volunteers and mission status. The event can’t be too early in the year or too soon after Christmas. Summer is out because of school vacations and spring break is different, even for schools in the same district. Carnes is a part of the National Code Quest team. “I love to see the kids compete and it is a great outreach for the community,” said Carnes. Lunch was donated by Chick-fil-A and others from the community donated raffle prizes. The event will soon go international, with sites joining from Whitley in the United Kingdom and Melbourne, Australia. 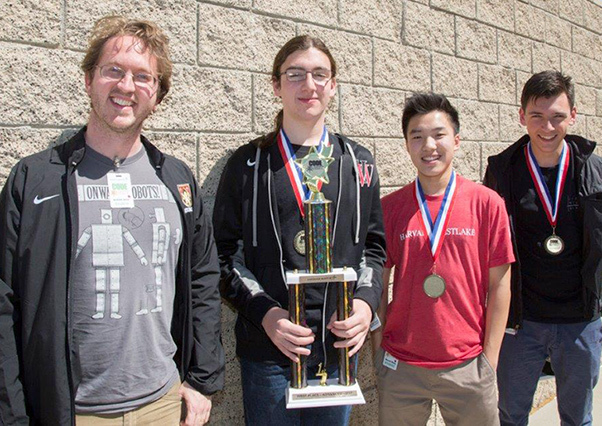 The top three advanced division teams from California were: HW Wolverines from Harvard-Westlake School, The Second Coming of Merlin from Mira Costa High School and Troy Warriors from Troy High School. Novice division: Stempia of Titotit, Inc., Code Blooded Questers from Mira Costa High School and Team West Ranch from West Ranch High School.